What we seek - and what we find - on a journey to Mahler's alpine composing huts. The first of two essays. The innkeeper passed me the key. He seemed to know why I had come. I was, I confess, slightly less certain myself. 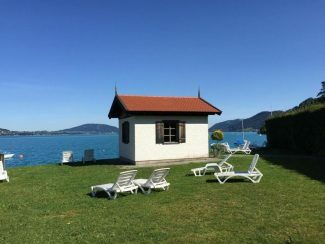 Mahler’s first of three composing huts, located in Steinbach am Attersee. Mahler of course meant the question rhetorically, but how much more fun it has always seemed to read it as a challenge to his own posterity — to those unborn listeners that he knew, with that 19th-century sense of certainty, would one day cheer the same music that had stupefied his contemporaries. Counting myself among this latter-day group, I had taken up the challenge. The day after reviewing a Mahler performance in Salzburg this summer, I rented a car and headed for the open road. Surely the answer could be found by following the river of Mahler’s music to its source. It is admittedly an odd feeling to plug in an 1893 address for Gustav Mahler into Google. One half-expects the search to generate ads for blacksmiths, village bands, or miracles (“interested in resurrection?”). But instead, I found a perfectly serviceable map to the village of Steinbach am Attersee, a picturesque lakeside town less than an hour from Salzburg. It was here that Mahler spent four glorious summers, and here that he built the first of his famous huts, the small composing studios in which he created almost all his music. In Steinbach, Mahler completed his Second Symphony and wrote his colossal Third. I’ve long been fascinated with the idea of Mahler’s huts. During most of the year, Mahler worked as a conductor, dealing with artistic hijinks and petty political intrigues, so it was only during the summer months that he had the time and mental freedom to compose. The activity nonetheless required a sense of tranquil solitude — with the comforts of civilization not far away. He built a total of three huts over the course of his artistic life — at once bunkers for a beleaguered soul and test kitchens for the future of modern music. I had once visited the Steinbach hut a decade ago, on a spontaneous trip with a fellow music critic. Clearly it was time to return. All of this said, upon arrival at the inn where Mahler lived with his entourage over a century ago, my confidence in my mission began to flag. Chasing the echoes of the musical past can easily seem a quixotic enterprise, even a naïvely literal-minded one. For years a reductive positivism reigned supreme in the study of classical music, and, the argument went, all you really needed to know was in the score itself. End of story. So what was I doing dragging a roller bag through the gravel of a rural Austrian parking lot? It turned out I didn’t really need to explain. Georg understood. The kind-faced innkeeper at the Hotel Föttinger quickly surmised that I was not there with the group of suntanned, spandex-sheathed mountain bikers who appeared to be the establishment’s main clientele. (Was it really so obvious?) Mahler’s hut, he explained, stands padlocked but unmonitored, about one minute’s walk from the inn’s back door. During the Salzburg Festival season, the hut often receives up to 10 Mahler pilgrims a day — some quite passionate. Georg told me that once a Belgian journalist had asked to sleep in the hut. Then there was the time when, in the middle of the night, he discovered a rollicking band of Canadian musicians in his backyard. They were searching for the hut in the dead of winter. I was impressed, but not surprised. Something about Mahler seems to inspire the bold personalized gesture of admiration. It may have to do with how his music stands poised on a knife’s edge between then and now, between tradition and the modern world. He carried the Romantic symphony to its grandest apotheosis at the same time that he dismantled its hierarchies, stretching the genre’s tent to include vulgar and sentimental music, street tunes, stomping peasant dances, dissonant howls of pain, and moments of rapturous sonic wish-fulfillment. Listeners of his own day were often baffled, but Mahler’s symphonies today are staples of every concert season — the Boston Ballet is currently performing the Third — and anticipated perhaps more keenly than those of any other composer. Why? There is no easy answer, but one can begin by saying that Mahler was contemporary enough that his music affords a fleeting glimpse of fellow-traveling. He was one of us, attuned to the experience of living in a fractured, fallen world. The music in fact shines a brutal spotlight on its deepest of fissures. The walk had changed since my last visit. In Mahler’s time, meadows covered with wildflowers led down to the lake. Later, livestock were kept here. Eventually the site was converted into a campground. On this visit, the mobile homes I had recalled at the periphery seemed to have multiplied to the point that the area had the feeling of a full-fledged camping village. It was morning. Men swept carpets as I walked by. The smell of a hundred camping breakfasts hung in the air. Suddenly, there it was. Nobody else was visiting the hut when I arrived. I unlocked the door and walked in. It’s a simple one-room structure that might, if larger, pass for a rural Austrian schoolhouse. An exhibition about Mahler’s life adorns the walls, and a replica of his piano commands most of the floor space. Nowadays, two of the hut’s windows look out onto the campground. But a third looks out onto the Attersee, its gently lapping water an impossibly rich blend of blues and greens that Gustav Klimt captured in a series of paintings made just a few years after Mahler’s time here. The hut’s own history is a tale of both cultural memory and unsettling amnesia. Once Mahler abandoned this village after the terms of his summer stays had grown unrealistic, the hut later was used as a slaughterhouse, and then apparently was attached to the campground bathrooms. It was restored to its present form only in the 1980s. And there I was, finally standing in the space again. The right mood seemed harder to summon than I would have expected. I looked at the exhibit displays, and tried to wrap my thoughts around what had transpired within these four walls. It was, in a way, a futile exercise, but it seemed at least a good idea to peer out the window and for a brief moment share the view that Mahler had enjoyed while drafting his Third Symphony. This work, after all, was Mahler’s grand hymn to nature — the whole spectrum, from inorganic stone to plants, animals, people, angels, and ultimately, love. It was a piece that he described as soaring above the terrain of his earlier two symphonies. Those works had trafficked in the landscapes of human vicissitude; the Third instead seeks to author a kind of God’s-eye view of creation itself. Staring in person at these very cliffs — known as the Höllengebirge — one comes away with a different impression. It seems clear that Mahler was never attempting a kind of musical landscape-painting in his Third Symphony, but rather projecting outward a private topography of the self. Here in this hut, through these windows, nature was intimately sensed, but also kept at a distance; not even the cries of birds were allowed to intrude. He was, it seems clear, aiming to strengthen his own voice by imagining it as coming from out there. The music of the cliffs was the echo of his own barbaric yawp. Of course Mahler was thrilled by these surroundings. But at the same time, what better way to smuggle in one’s radical assaults on symphonic tradition than by cloaking them in the garments of something as unchanging and timeless as nature itself? I’m not sure how long I lingered in the hut. Maybe 30 minutes, maybe an hour. Walking back through the campground, I passed a man working on his power generator. I wondered what he thought about it all, about that strange little white house where all the people with cameras come. As I ascended the small hill toward the inn, the slight sense of anticlimax I had experienced in the hut itself quickly vanished. The reason I had come seemed a bit more clear as I thought about this strange phenomenon of cultural pilgrimage, and about the ways in which music itself can blur the boundaries between past and present, between the time of the composer and the moment of live performance. A musical work has both temporalities inside of it. The pilgrim wanders in the haze. Maybe more great works of art, it struck me, should have their own tiny huts, physical places you could visit that symbolize their very essence. Of course someone is always fixing their generator nearby, or wanting to turn the hut into a bathroom. But maybe the impulse to seek out these places nonetheless is not naively literal-minded so much as it is part of how we make the works our own, the way we locate their cosmic expressions on a more humble map of lived experience. Maybe to love a work of art is to feel you’ve shared its secret. You cannot put it into words precisely, but you know it. You’ve been to the hut too. You’ve looked out through the same windows. Back at the inn, I thanked Georg and returned the key. Naturally, in a certain sense, I kept a copy. Visits like these become part of the personal histories we inscribe in the works themselves over the course of a life of listening. Mahler’s music may not be in this place, but the place is now in the music. These days, I can no longer hear the Third Symphony without calling to mind my two visits to where it was born, beneath a small sloping roof ringed by mountains, water, and sky. This article appeared in the Boston Globe on October 24, 2015 under the headline “Visiting the birthplace of Mahler’s epic ode to nature.” It was the first of two essays on the composing huts of Gustav Mahler. The second essay may be found here.